Unlike many other owl species, the adult male and female burrowing owl (Athene cunicularia) are the same size. During their nesting season in early spring, the pair acquires a burrow previously inhabited by prairie dogs or other small mammals. In preparation for the clutch of three to twelve eggs, the expectant parents give the new place a unique kind of spring-cleaning, lining it with mammal dung (usually cow). This aromatic addition not only aids in climate control but also attracts the owls’ favorite snack: dung beetles. 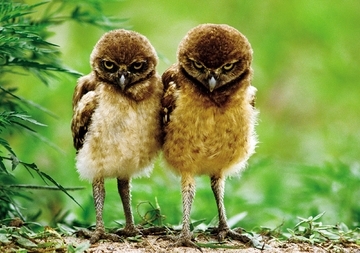 Both parents care for the owlets until they are ready to leave their odiferous abode.